While it is always the goal to save our patients’ natural teeth, there are certain cases when extracting (removing) the tooth is the best course of action. With extreme decay, infection, or trauma, removing the tooth entirely is sometimes the only route to go. When a tooth is removed, the next question is how to replace it? One of the best methods for replacing an extracted or missing tooth is with dental implants. Monrovia patients often ask us if it is okay for them to delay or not replace the extracted tooth. In this blog post we want to look 3 issues that can arise when a missing or extracted tooth is not replaced. If you’ve suffered a fall or an accident that has cracked or chipped your tooth, make sure you call Monrovia dentist, Dr. Q immediately at (626) 599-9819. Even if you have a large cavity or infection, Dr. Q can help with a root canal or recommend another treatment method. The best thing you can do if you’re suffering from any kind of dental problem is to get it taken care of as soon as possible. Waiting will often allow the problem to become more painful (and expensive) to repair. We know that patients often experience a lot of stress and anxiety about going to the dentist. 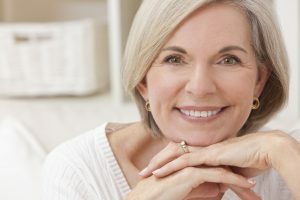 Take a look through our page of patient Reviews to get a better idea of the gentle and compassionate care that you can expect with Dr. Q.
Monrovia patients that may have missing teeth because of an infection or because of a bad accident can get a beautiful, full and natural-looking smile with dental implants. Here’s a quick look at how they work. The post – While dentures and bridges just cover up the missing tooth, dental implants actually replace it with a functional tooth. To do this, Dr. Q implants a medical-grade titanium post into the jawbone. This post will fuse with the bone as it heals and create powerful support for the tooth. The crown – After the post has healed, Dr. Q will place a crown on top of it. This crown is matched exactly to the size, shape, and color of your other teeth so that it is virtually indistinguishable from your real teeth. Missing teeth pose several very big emotional and physical hurdles for patients. Bone loss – The greatest risk with missing teeth is bone loss. Your jawbone needs something to “hold onto.” With our natural teeth, your jawbone holds onto the root of the tooth. But with a missing tooth, that stimulation isn’t there and your bone will start to literally melt away. This can actually cause the patient’s face to change because of a loss of bone structure. Because dental implants use a titanium post implanted into the jawbone, the bone will not erode. Emotional – Many of our patients with missing teeth tell us that it greatly impacts how they behave. Some of them avoid meeting with friends or family because of the gap in their mouth. Others have said that they avoid speaking up in conversations or smiling because of it. Chewing – Finally, patients with a missing tooth or teeth will lose quite a bit of chewing power. This can force them to use the other side of their mouth to chew and will cause those teeth to wear down faster. Monrovia patients first need to understand that they are not alone. Over 25% of Americans age 65 and up have either lost a full arch or all of their teeth. Missing teeth are incredibly common. But it is vital that you get them replaced. Dr. Q has been proudly serving the Monrovia community for over 10 years. Our patients love how gentle and efficient she is. We also offer a full suite of sedation dentistry options to ensure that you’re comfortable throughout your procedure. We would love to talk with you and learn more about how we can help. Call us today at (626) 599-9819 to get started.